When we have a client looking to install a donor wall in their facility, we always collaborate closely with them to design a recognition wall which reflects their organization’s brand and personality. One great example of our collaborative design process is the donor wall we recently constructed for Chiaravalle Montessori in Evanston, Illinois. The Chiaravalle Montessori school works with children ranging from infants and toddlers to middle school students, and all of their students are encouraged to discover their own interests and teach themselves through immersive experiences. The educators’ focus on children and self-guided education is evident in every area of the school’s brand and marketing strategy—even down to the bright rainbow of colors used in their logo and throughout their website. When Chiaravalle Montessori reached out to us for help designing a donor wall recognizing the supporters who had funded the building of their new educational wing, we knew we wanted to create a display which reflected the same vibrance as the rest of their building and brand. We used their logo for inspiration, and drafted a design which included the same colorful wavy S shapes seen in their logo. We also found a way to subtly note the various donation amounts from the funders of the new wing by attributing certain colors and sizes of the name plates to the different donation levels. 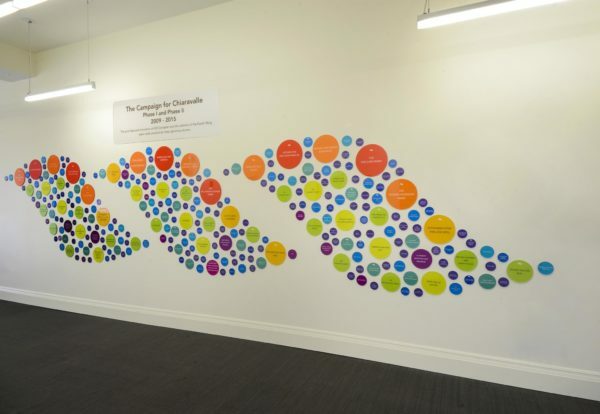 Although the school chose not to publicize the specific donation amounts on the recognition wall, the largest donors were able to see their names on the biggest circles at the top crest of the waves. The donor appreciation display we designed for Chiaravalle Montessori is something we call a closed donor wall, which simply means all the names of the donors for this project were available during the design process. We did not have to leave room for future supporters’ names to be added to the display because this wall only needed to recognize the donors who had funded the building of the school’s new wing. Once we knew how many names would be included in the design and the donation levels associated with each name, we randomly placed name plates across the design template without regard to alphabetical order. Before finalizing the design, we made sure the name plate sizes and colors were evenly distributed throughout the waves so each part of the display would look balanced. Now teachers, administrators, parents, and students pass by the donor wall each day when walking through the corridor which connects the old and new wings of the building. If your organization has recently completed a capital campaign for a new facility, an addition to your infrastructure, or some other milestone project, a donor appreciation wall may serve as a great way to thank your most dedicated supporters. Contact us for information about how we can work with you to design and install a donor recognition display in your facility, or check out our work with other clients for inspiration. Why are custom donor walls important?